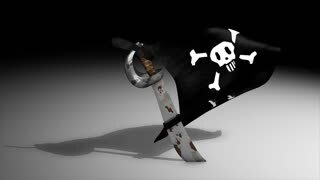 A beautiful satin finish looping flag animation of the Jolly Roger. A fully digital rendering using the official flag design in a waving, full frame composition. The animation loops at 10 seconds. Skull and bones on a green old wooden background. 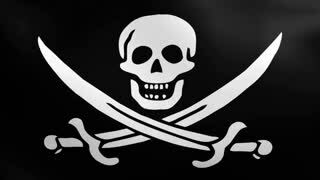 Pirate flag symbol. 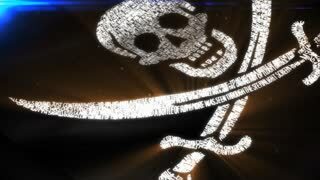 Waving torn pirate flag with jolly roger skull in cocked hat and crossed sabers. 3D render looped video with alpha channel. 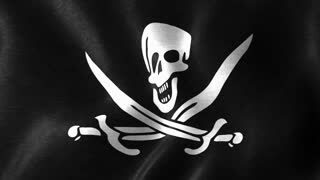 Looking at a Jolly Roger skull and crossbones pirate flag waving through a marina full of sailboats in slow motion. 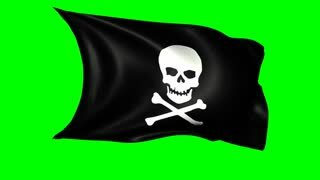 A skull and crossbones pirate flag flying in the wind in slow motion on a sailboat in the harbor. Ukraine, Chernomorsk, August 20, 2017: Jolly Roger. Pirate flag against the sky. 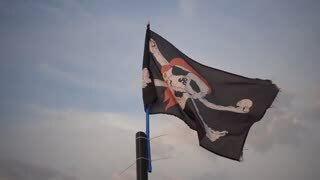 3D Pirate Flag waving, white skull and bones in blue sky time lapse.